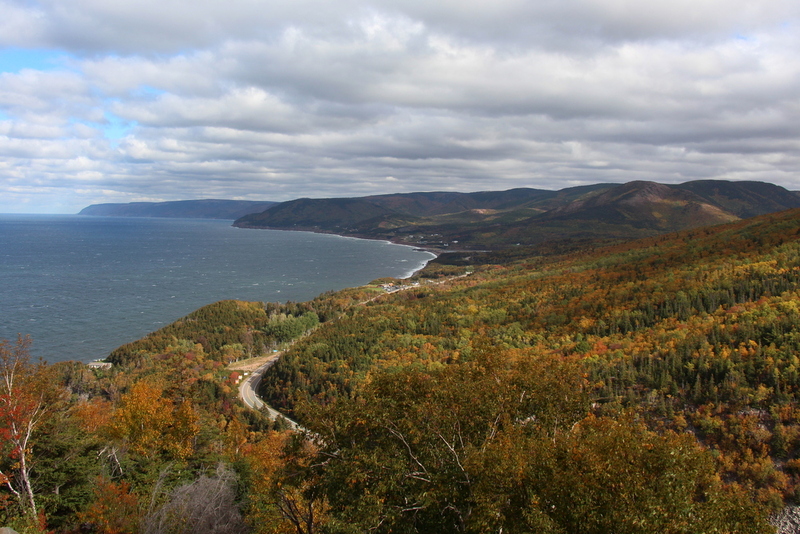 One of the things my boyfriend and I have been promising to do for over 6 years is take a trip to Cape Breton. 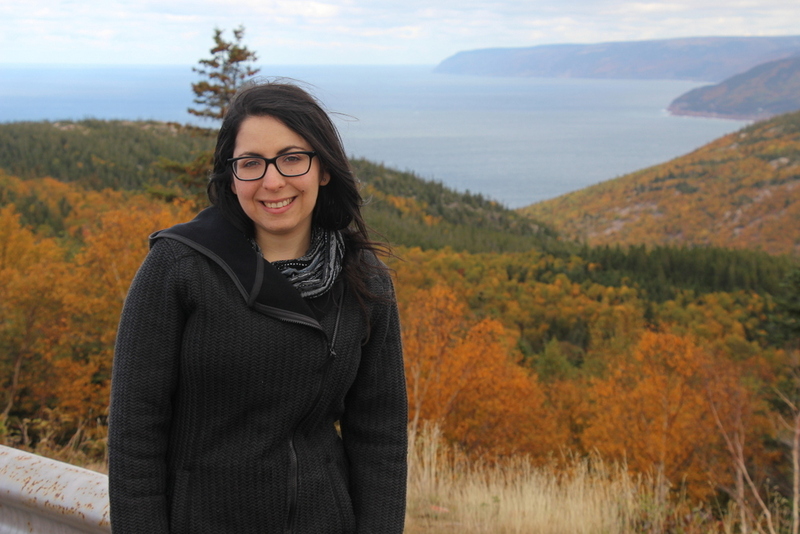 We finally made it for a weekend in Cape Breton, and although I always mean to blog about my trips (and fail) I thought I could start by sharing this one. 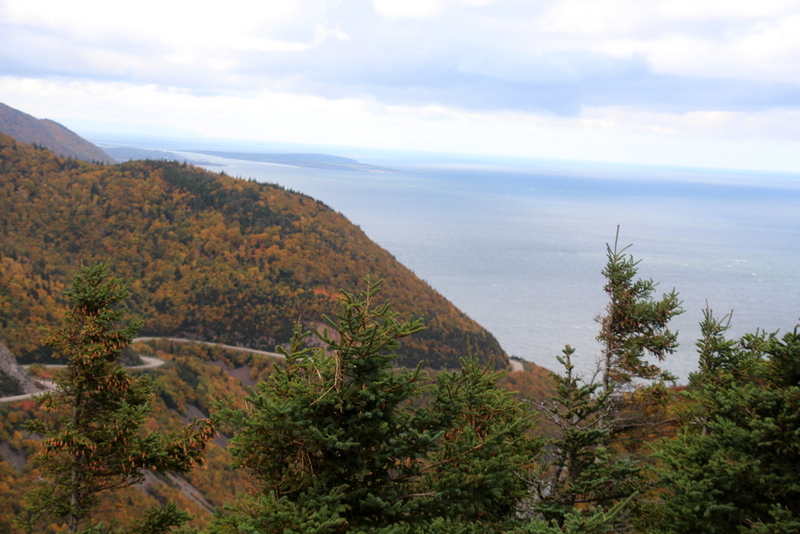 Nova Scotia isn’t that big, and no matter where you live it is (relatively) reasonable to make the trip, although you may need a day or two longer than we did. 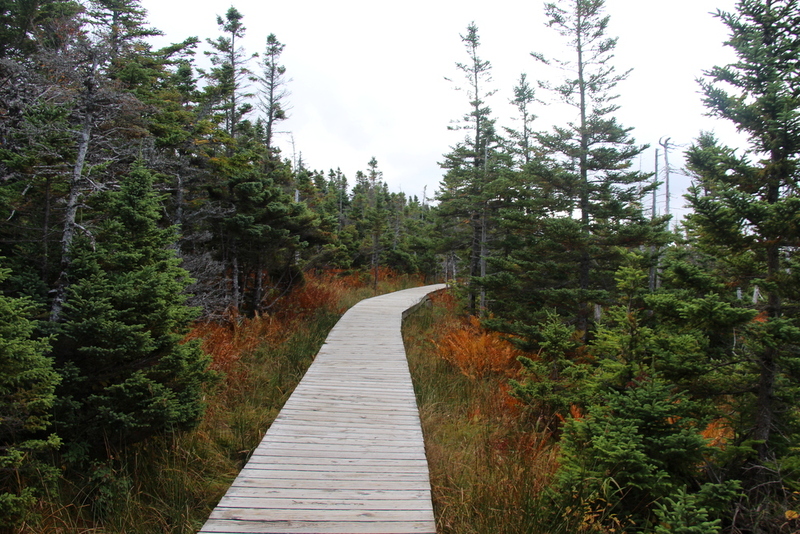 Even if you are traveling from outside of the province, this is a gorgeous destination for anyone who loves nature, and if you time it right you can even add in a bit of history by stopping by Louisbourg, or enjoy a whale watching tour. 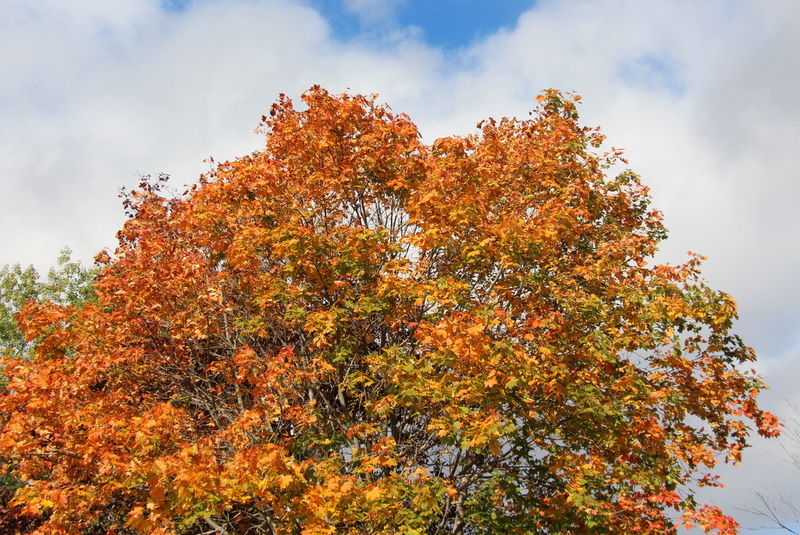 We headed off in mid-October in order to enjoy the fall colours. 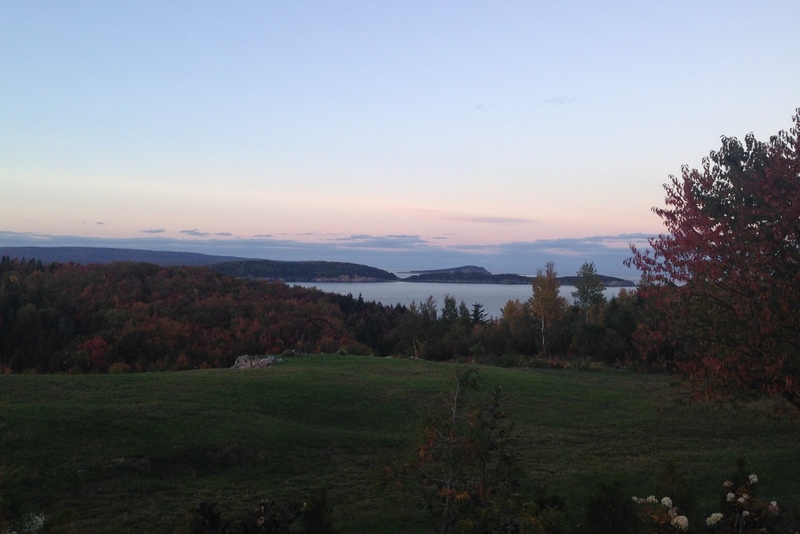 I’ll share photos of each day, with a few anecdotes along the way! 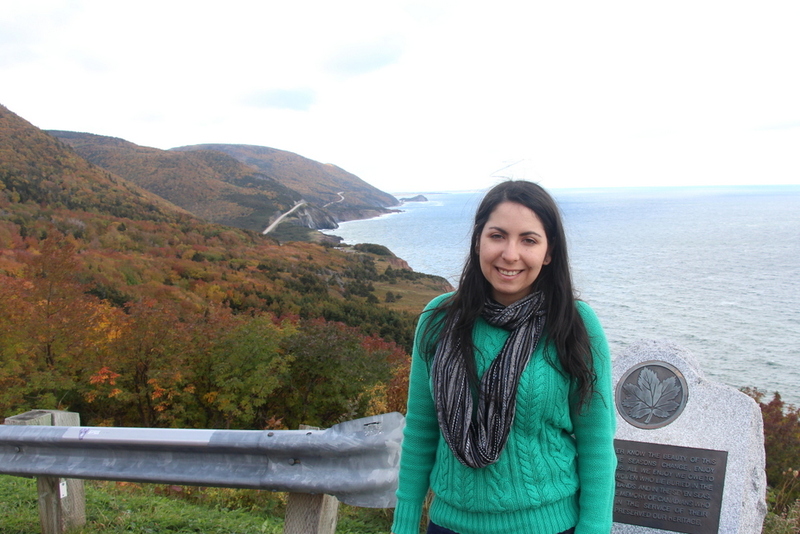 Friday was quite a drive, but when my boyfriend nudged me awake (I am the worst passenger) before we crossed the Canso Causeway into Cape Breton, I was pretty excited. Only two more hours of driving to go! 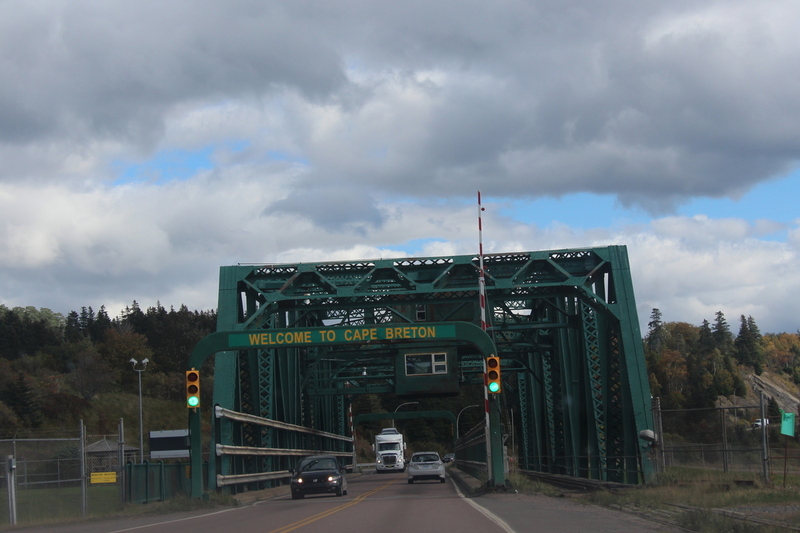 It’s pretty crazy that this is the only thing connected Cape Breton to the rest of Nova Scotia. 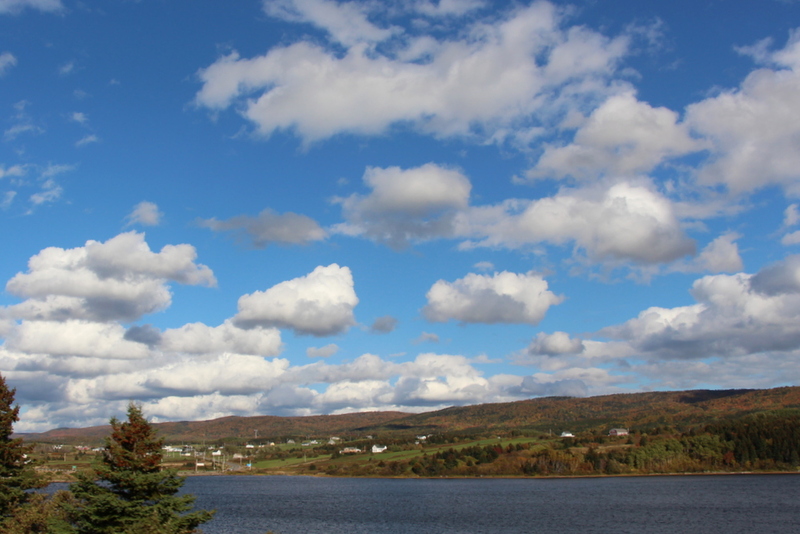 Once we were officially on Cape Breton land, we made a little stop in Port Hawkesbury, which is officially not really worth visiting unless you have a reason. Mine was that my boyfriend had gone to school there, so he showed me the area and we stocked up on Tim Horton’s (I didn’t want to sleep through the rest of the drive!) before we were on our way again. 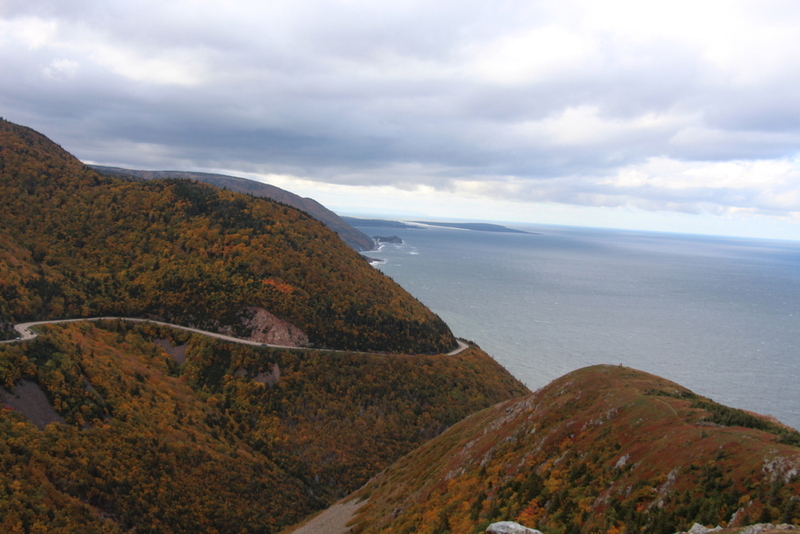 The rest of our Friday drive took us from Port Hawkesbury, onto the Cabot Trail, all the way up to Cheticamp. 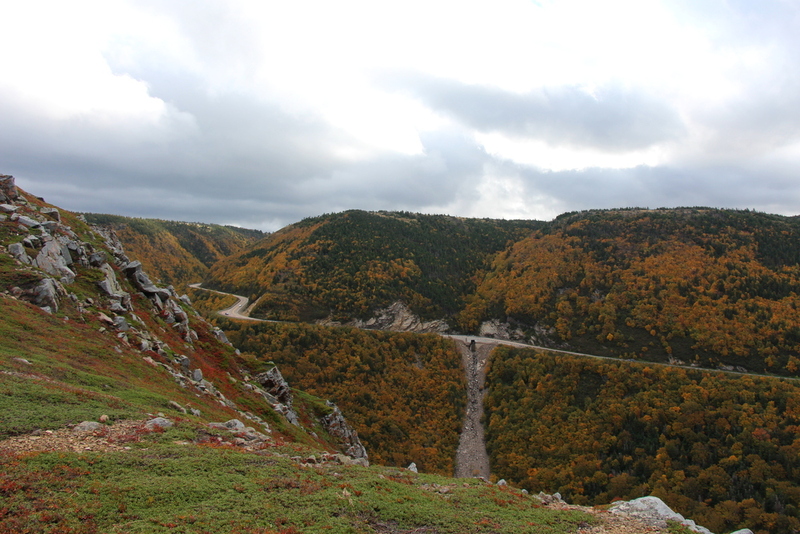 We arrived in Cheticamp around 4 in the afternoon, and after some difficulty finding our motel thanks to an out-of-date GPS map, checked in. Apparently this has been a problem before, although it should be updated, so if you’re headed to the Cornerstone Motel in Cheticamp, make sure to follow the numbers, not what Garmin wants you to believe. 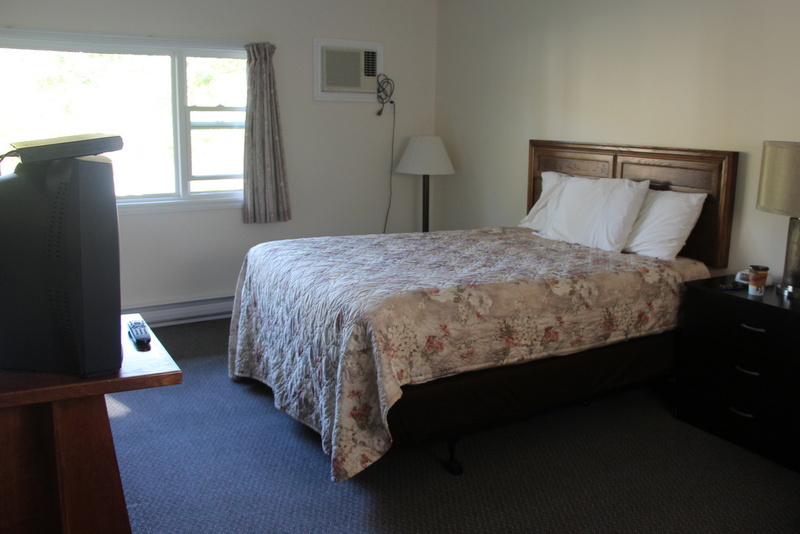 The Cornerstone Motel is located just outside of Cheticamp, and was immediately welcoming thanks to Cathy and Greg, who own the Motel. 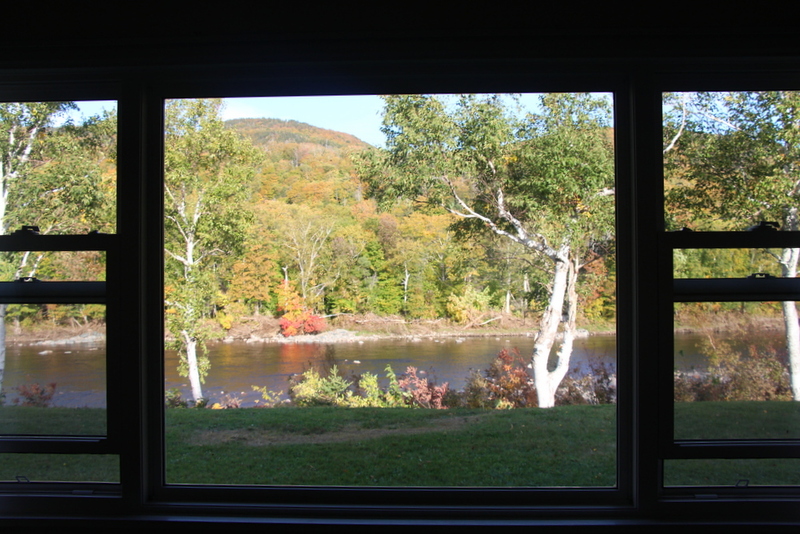 There are 3 types of rooms available, River View, Mountain View and Single, and we went for the River View of Cheticamp River. As you can tell, the scenery was well worth it! My only regret is that the sun sets so early this late in the year. The room was comfortable, although I did find a couple bugs probably because of the location, it was still very clean. I liked that there is a mini-fridge available, because if you’re packing any of your own snacks for the trail, that is quite helpful! We also got great advice from Cathy and Greg about activities, including a recommendation that we drive to Pleasant Bay for supper, although we were too tired for that. One unexpected and thoughtful gesture? When we checked out the next morning, Cathy offered a cup of coffee (or tea, or hot chocolate) for the road. I picked one up for my boyfriend, who honestly expected it to be terrible, but drank it black and actually really enjoyed it! 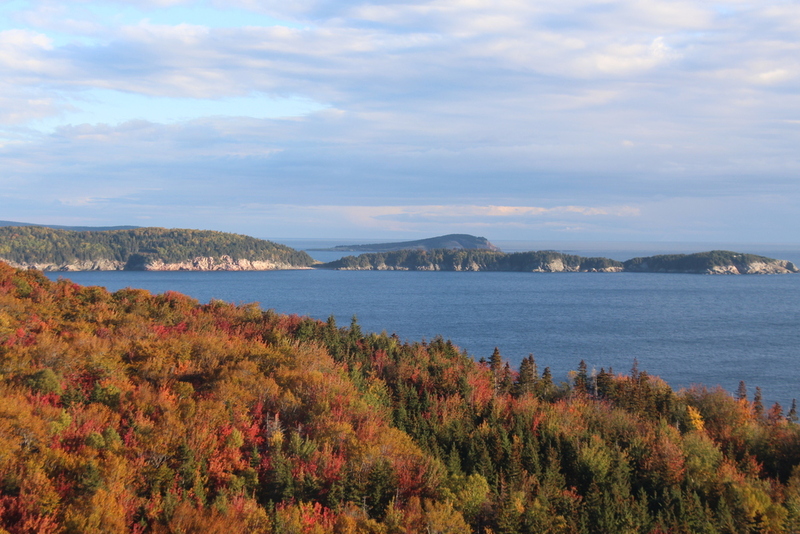 Although we didn’t make it to Pleasant Bay that evening, we did take a drive over to Cheticamp Island. There’s honestly not much to see, but I was lured in by Cathy and Greg sharing that there are a lot of cows that live there. Apparently you can buy a cow and it is taken care of, and then at the end of the year you get the meat from it. 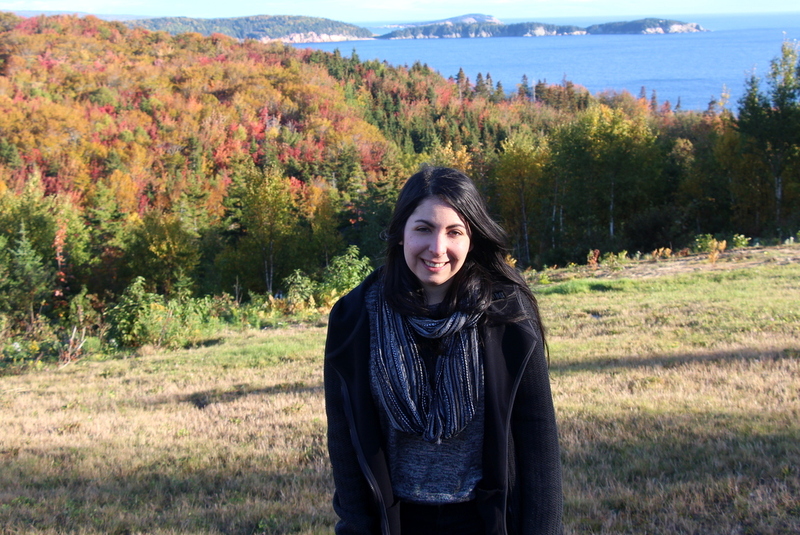 As we were leaving Cheticamp the next morning we saw all the cows grazing near the water, so they definitely exist! 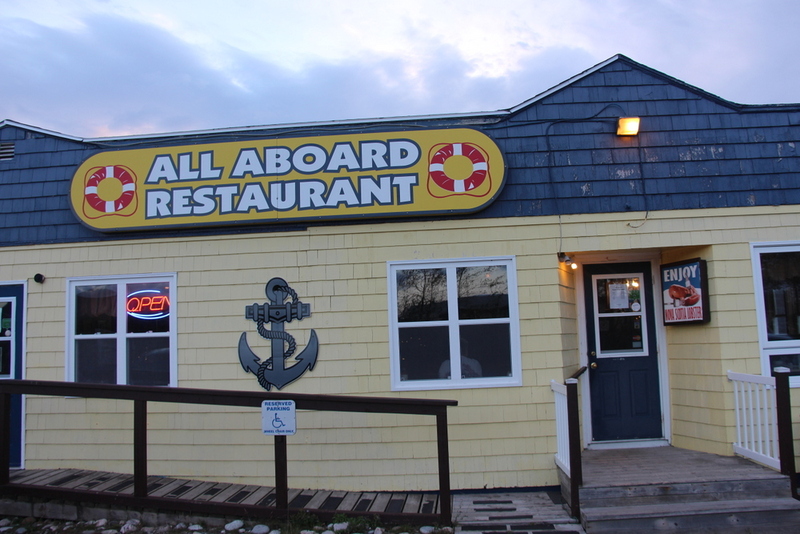 We stopped in at All Aboard Restaurant for supper on Friday evening, based on online reviews I’d read as well as Cathy and Greg’s recommendation as the best place in Cheticamp for seafood. All Aboard will only serve you lobster is if it is fresh, so sadly that meant there was none on the menu when we were there (although they did offer to replace it with crab in the Surf & Turf). I went with the Crab Leg Dinner, which took me an incredibly long time to eat because I don’t even know the last time I had crab. As always, I was concerned about gluten, but the waitress actually had celiac disease herself, and recommended the dish and mashed potatoes. The potatoes were nothing special, and the crab was quite pricey (it is priced by Market Value) but it was definitely fresh and quite a treat! 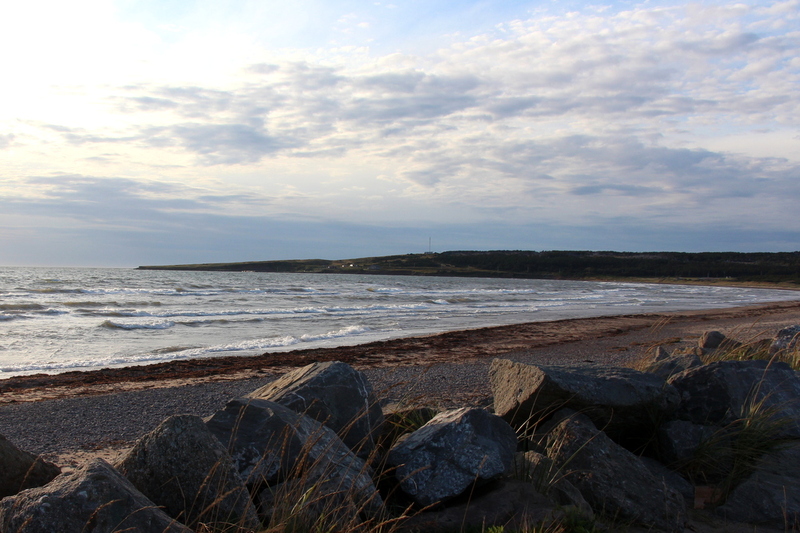 After all the driving, we settled in for an early night, before we were off to explore the Cape Breton Highlands National Park the next day. Saturday morning started early with breakfast at Restaurant Evangeline in Cheticamp, which had been recommended by Cathy and Greg and opens very early. It is a fairly basic dinner-esque restaurant with standard and tasty breakfast options. The only issue was they somehow misplaced our order so it was pretty slow, but everyone else around us got serviced quite quickly so that’s not the norm. There wasn’t a safe gluten-free fryer, so I skipped on the potatoes, but had eggs, bacon and even some gluten-free toast. I’m not really an egg person but these were very yellow and the whole meal was quite good! 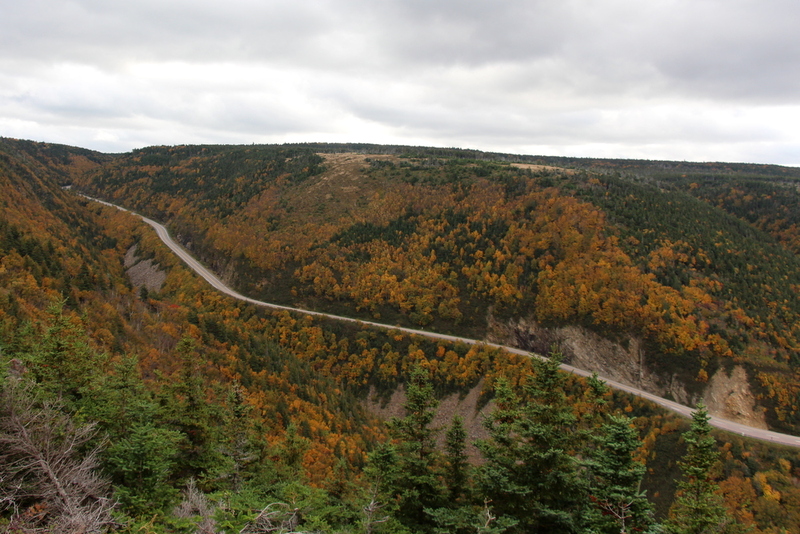 We were still on the road by 8:30 and headed off along the Cabot to the Cape Breton Highlands National Park. 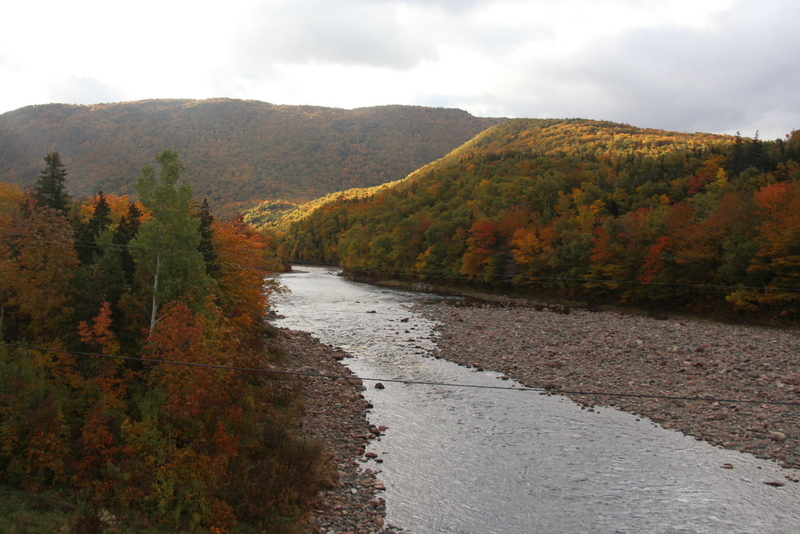 We did make a quick stop just past the hotel to take in the Cheticamp River, but quickly stopped just past our hotel to take in the Cheticamp river, which looked quite pretty with all the fall colours. I mean, everything did! 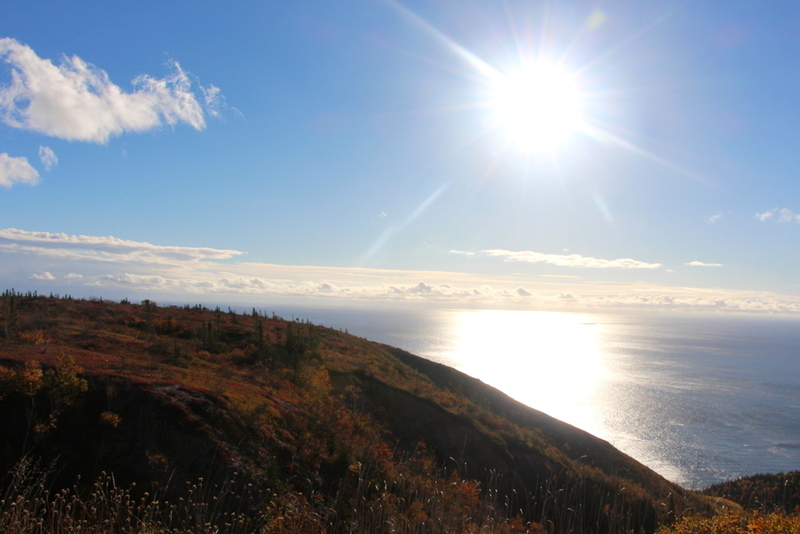 There are so many gorgeous lookouts to stop at along the Cabot Trail, but I have to admit that the Cheticamp side going towards Pleasant Bay was probably the most consistently beautiful–it’s no surprise there are so many trails and stops! 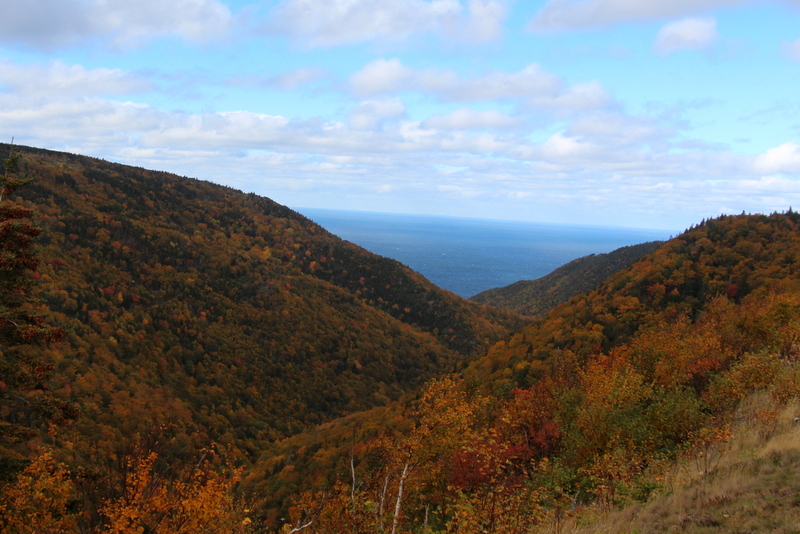 My boyfriend has a bad knee, and wasn’t feeling great on Sunday, so we only did one real hike at the Cape Breton Highlands National Park, but it was the one I was most excited for, the Skyline Trail. We skipped the extra loop it seemed like most people did and I’d heard from a friend it wasn’t worth it. 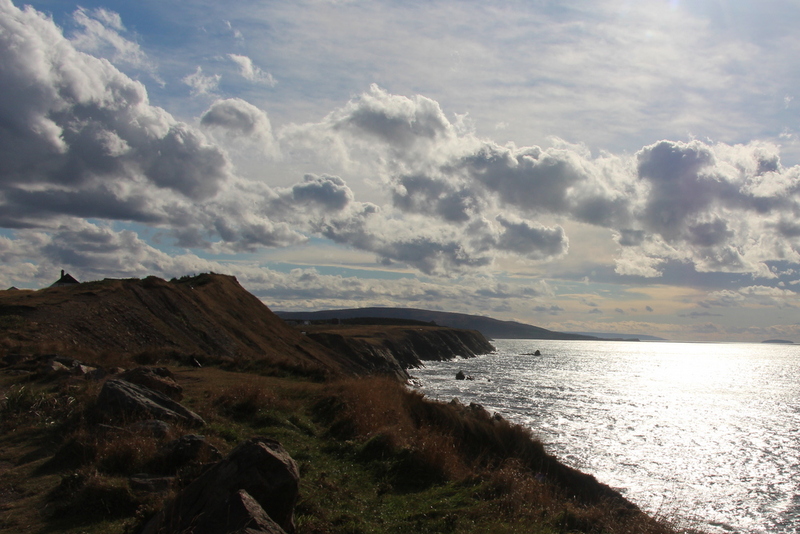 The view we had was gorgeous though, even if it did get a bit cold up there! There’s also a neat science experiment going on with a whole area blocked off too moose to see how the vegetation regrows without them. 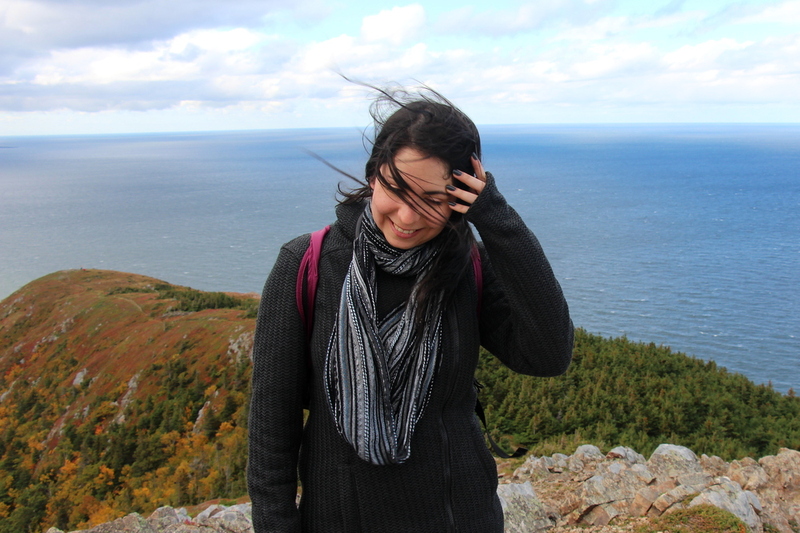 It was very windy as you can tell, but definitely a gorgeous hike and worthwhile. The ground is very flat and easy to walk with the exception of a billion steps at the end if you want to get closer to the water, so it’s pretty accessible to most skill levels. 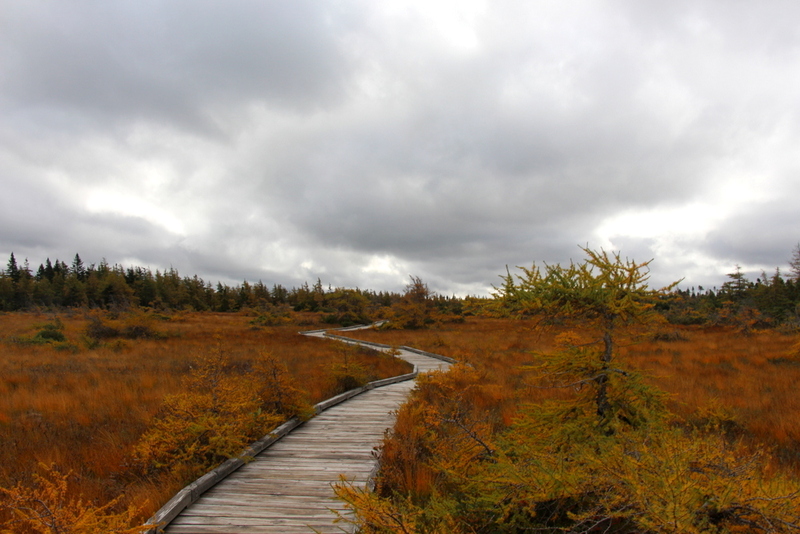 Almost right after the Skyline Trail is The Bog, which we stopped to visit on a recommendation of a friend, but it honestly took 15 minutes max so it’s definitely worth it. 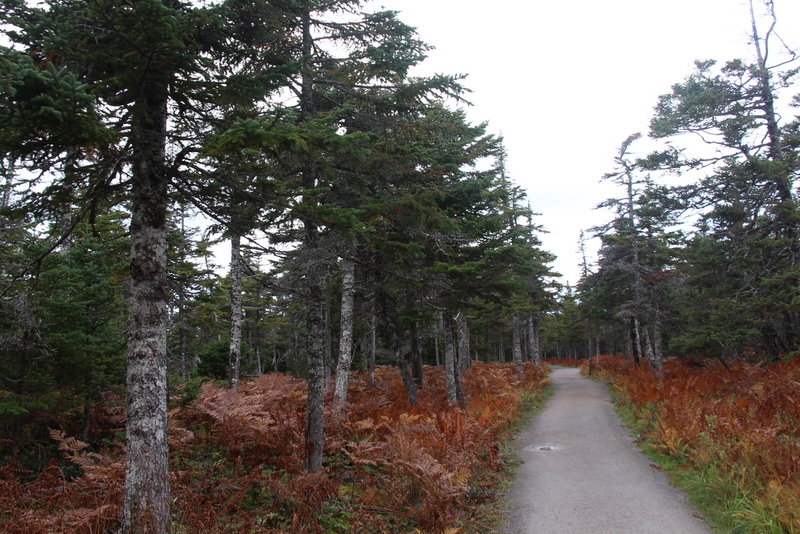 It’s consider a trail but less than half a kilometer, and it’s all flat. 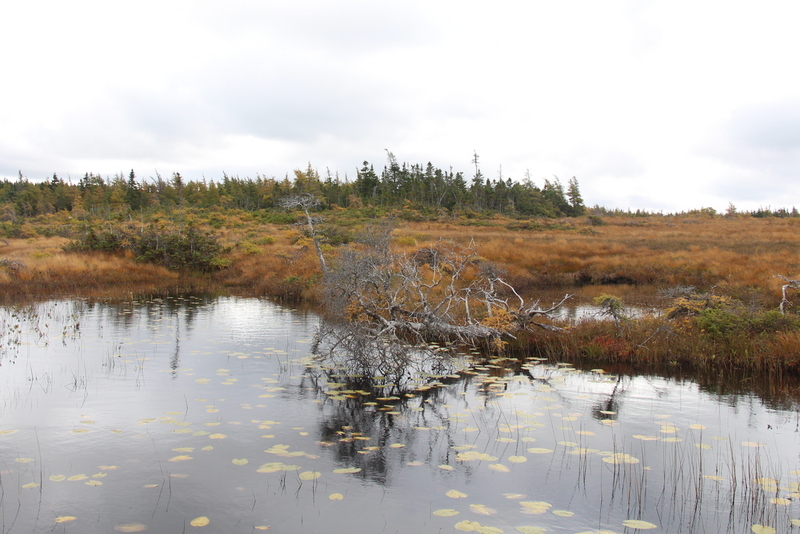 This is a great place to see moose, especially at night, but sadly none were out while we visited! 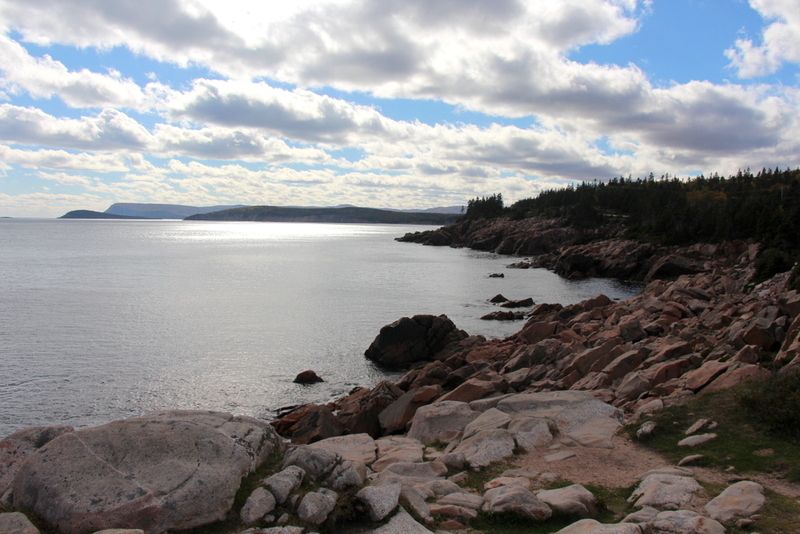 Not much to say about all this, more beautiful scenery and windy stops as we drove the rest of the way to Ingonish. 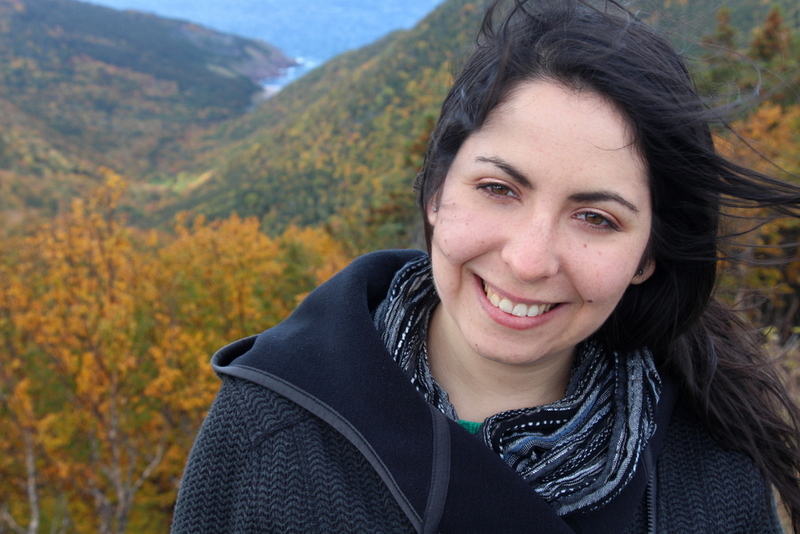 We had been planning to stop for lunch in Pleasant Bay at the Rusty Anchor, but the parking lot was overflowing, so we ate some snacks in the car instead. If I went back I would definitely take a cooler and pack a good lunch for both days. 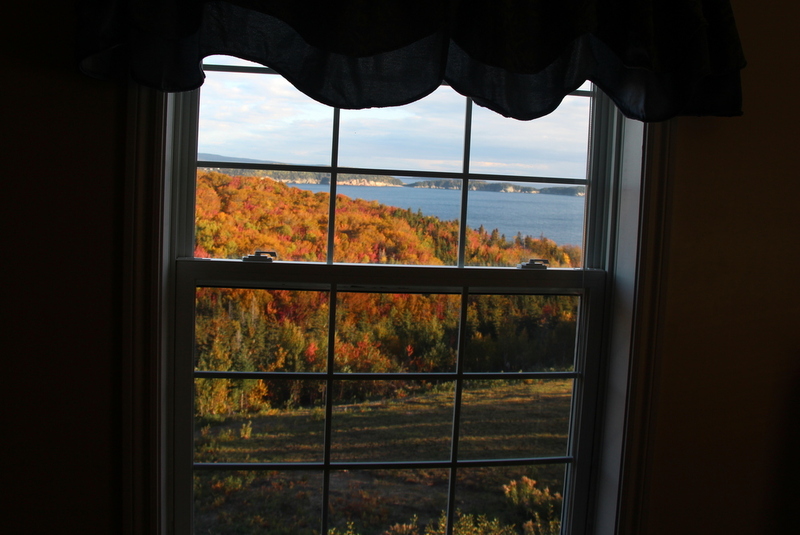 On the other side of the Cape Breton Highlands National Park, we checked into our hotel, the Castle Rock Country Inn, which is located just on the other side of Ingonish. 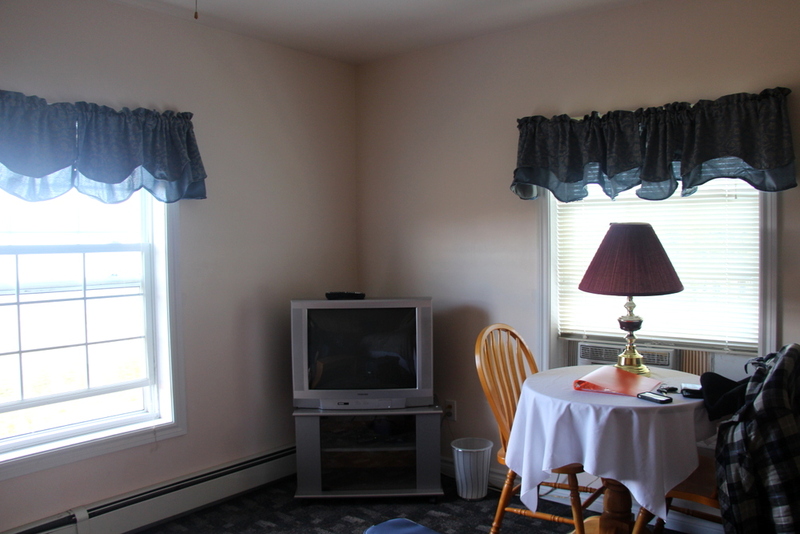 This is a really nice property, and we booked an Ocean View room. The view was GORGEOUS! There’s technically WIFI but it’s very difficult to get any that works. The lady we spoke with most at the Castle Rock Country Inn was very friendly, and suggested a great restaurant when we said we weren’t having supper there. The restaurant at the Inn is quite fancy and I hadn’t read great reviews online, plus we were pretty hungry already after skipping lunch! The experience was nice, but I don’t think it’s worth the higher price tag ($40 more than the night before). 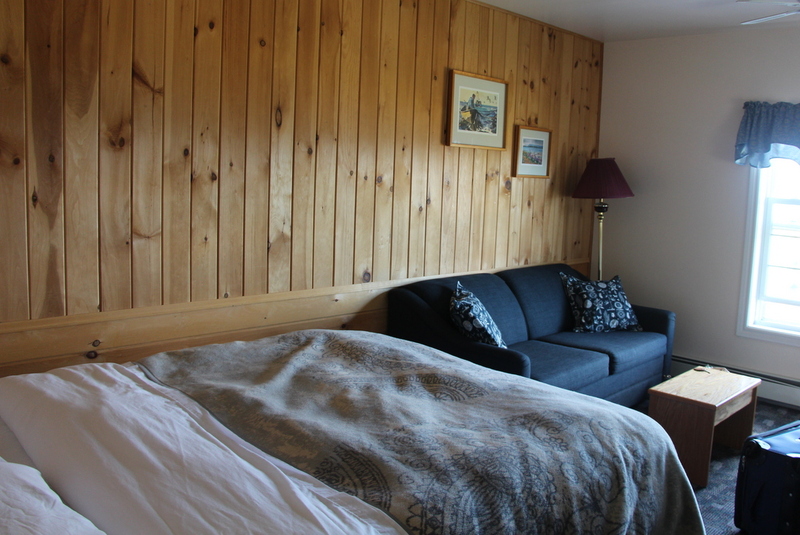 The stay does include breakfast, and there were hard boiled eggs, ham, a variety of breakfast cereals, yogurt, and toast the next morning. It was a bit nicer than continental, although I couldn’t eat much (but that’s usually the case), my boyfriend could and wasn’t very impressed. 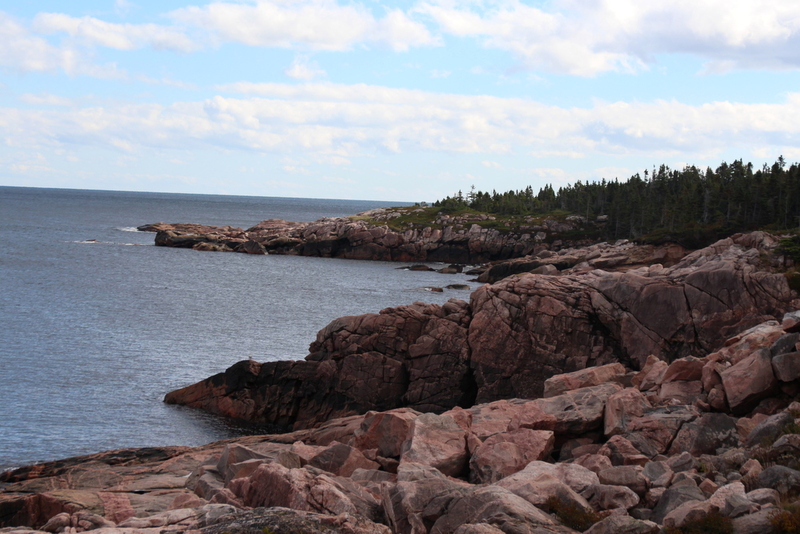 Originally, we had been planning to do some nearby hikes the next day, which made the location quite helpful. 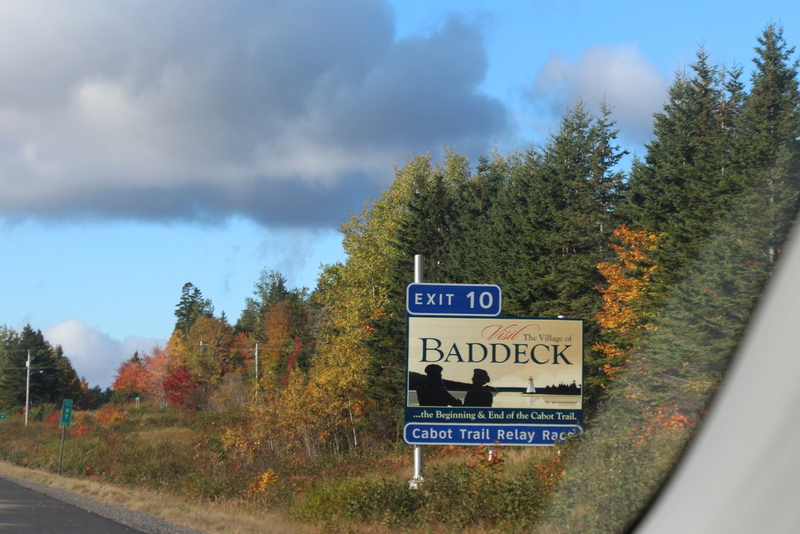 If we hadn’t been, I think we would have been best off driving another hour to Baddeck (which is quite lovely) and staying somewhere else for a smaller price tag. I really did enjoy the view though! On the recommend of the Castle Rock Country Inn we visited the Main Street Restaurant & Bakery in Ingonish for supper, and I can easily admit this was the most delicious meal I had all trip! 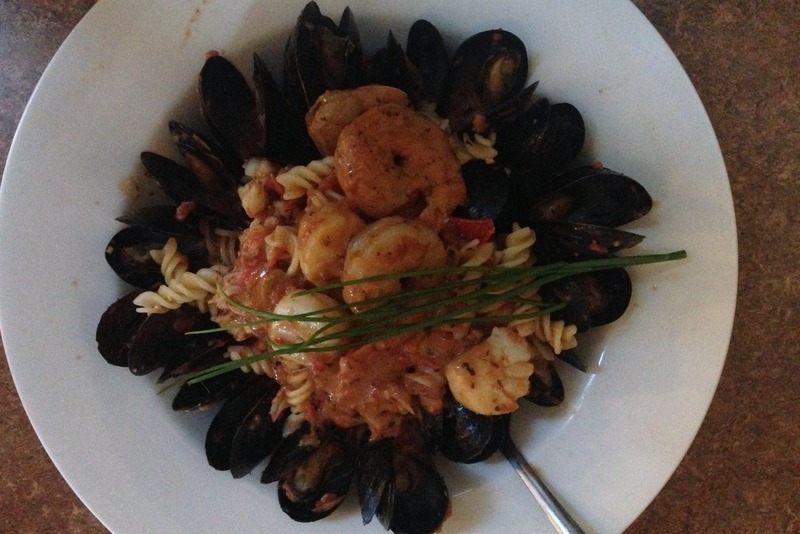 There were plenty of gluten-free options, including a gluten-free pasta, so I ordered it topped with loads of seafood in a tomato based sauce including amazing shrimp, scallops and Cape North mussels. We were early enough at the e Main Street Restaurant & Bakery to order off the lunch menu, so this quite affordable (under $20) and I understand why the place was packed! Although I couldn’t eat any of them, the desserts also looked amazing as there was a huge selection of pies. 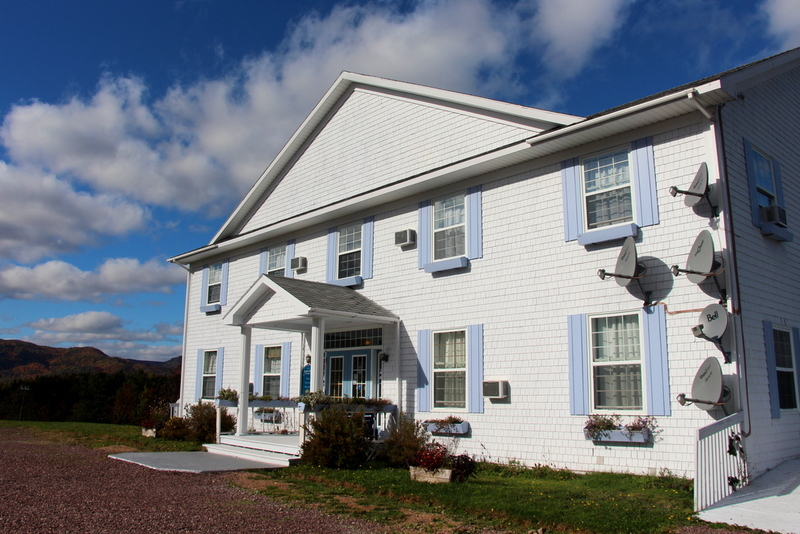 Whether you stay in Ingonish or not, I highly recommend stopping for a meal here! 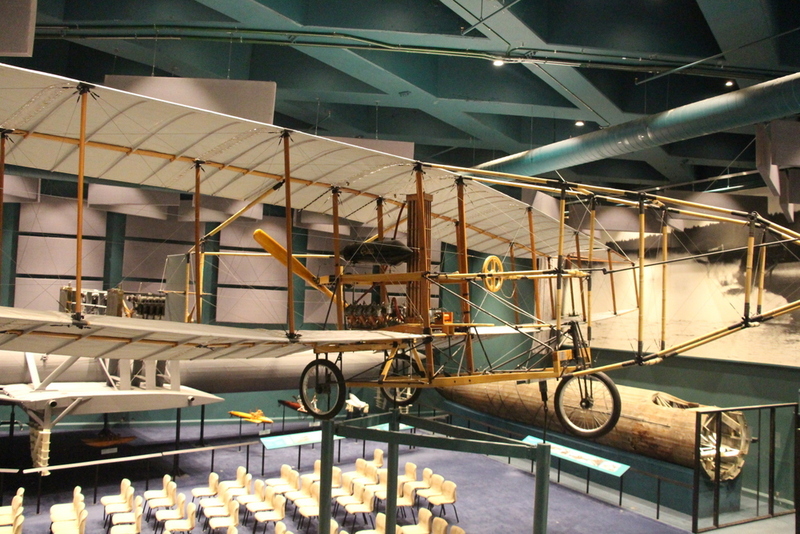 Saturday evening was another quiet night for us–you might sense a theme to my travels! 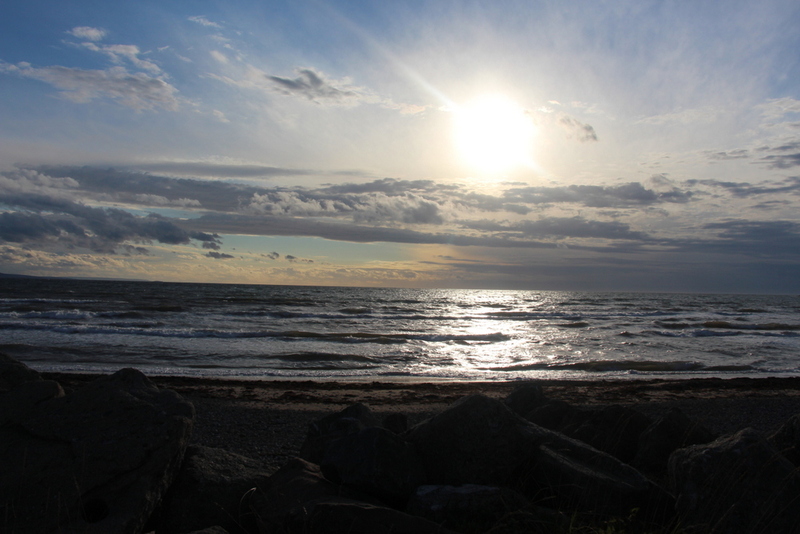 But there was a lovely view to enjoy over the ocean. Sunday morning we grabbed a few more photos of the gorgeous view at the Castle Rock Country Inn (my boyfriend took that second photo through our window!) and had breakfast there before checking out. 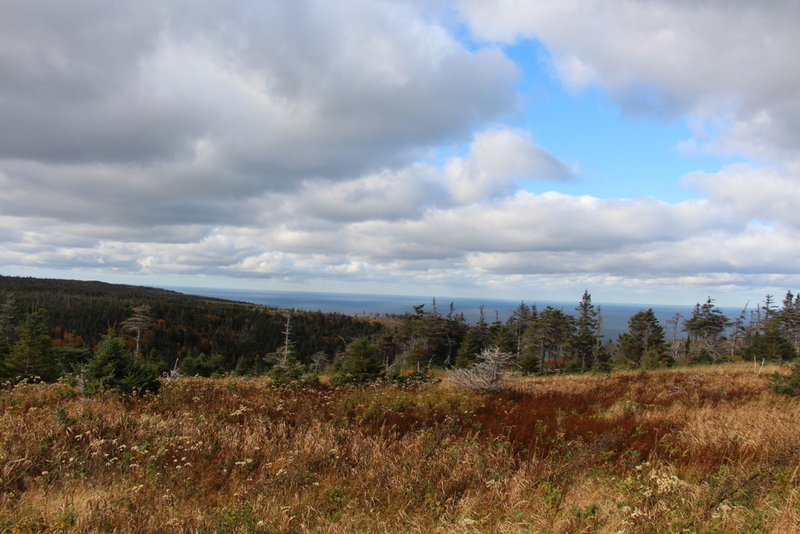 Originally, we had been planning to do another hike and stay the evening in Baddeck (There are a few nearby) but my boyfriend’s knee was acting up so we decided to head home instead. 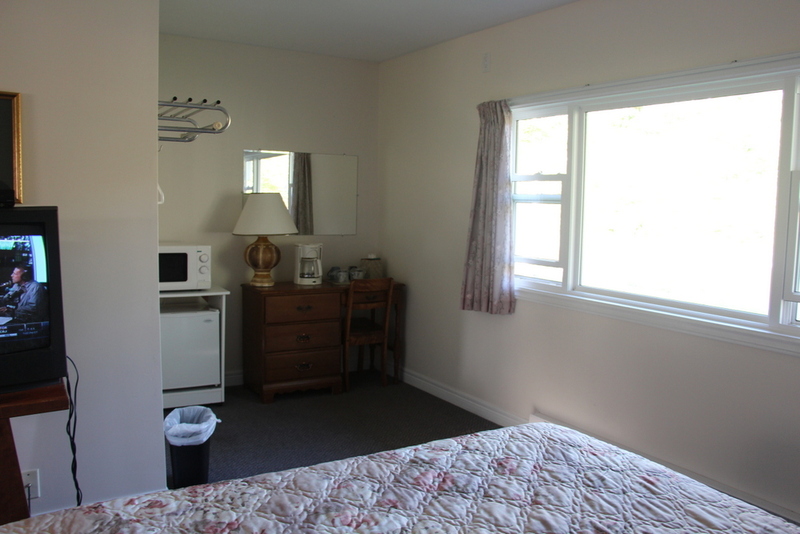 When I called our Baddeck hotel about cancelling they were thrilled to accommodate because apparently they hadn’t had any new guests all week and were going to have to do up a room just for us. We were visiting the weekend after Thanksgiving and things really start to shut down! 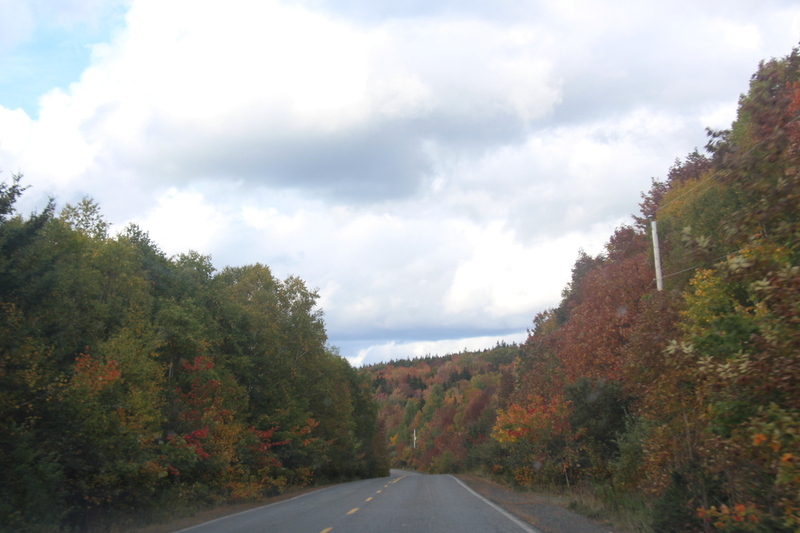 The drive from Ingonish Beach to Baddeck does have some lovely views as well and we were lucky enough to have another day of gorgeous weather. You can also see a little bit of a glimpse of my dirty windshield. 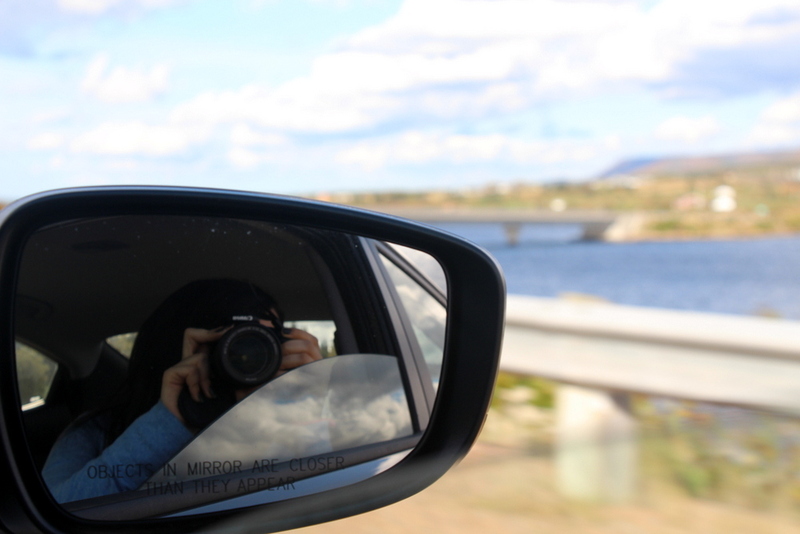 My boyfriend wrote CLEAN ME on it before we left with the intention that we would actually do that when we stopped at his mom’s…and then we didn’t, so it stayed for the whole trip and ruined many photos. 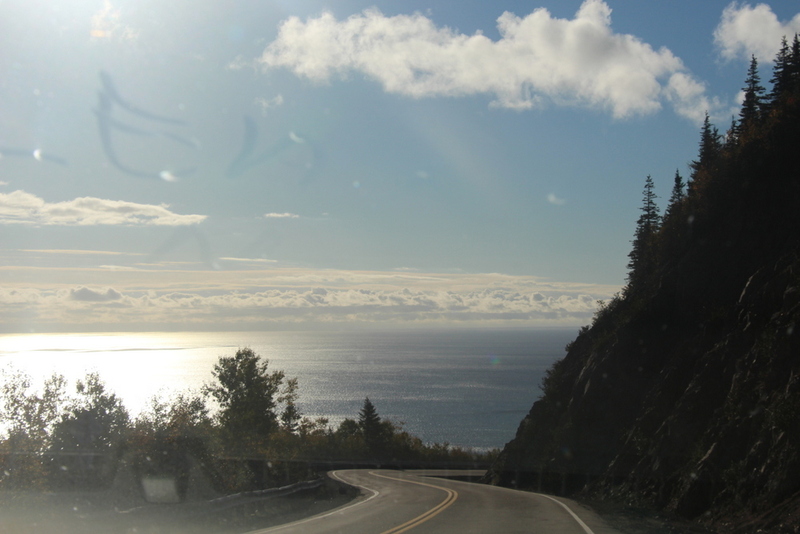 I really wanted to capture the way you drive right down and it almost feels like you’ll go into the ocean though, so you get the dirty windshield photo anyway! 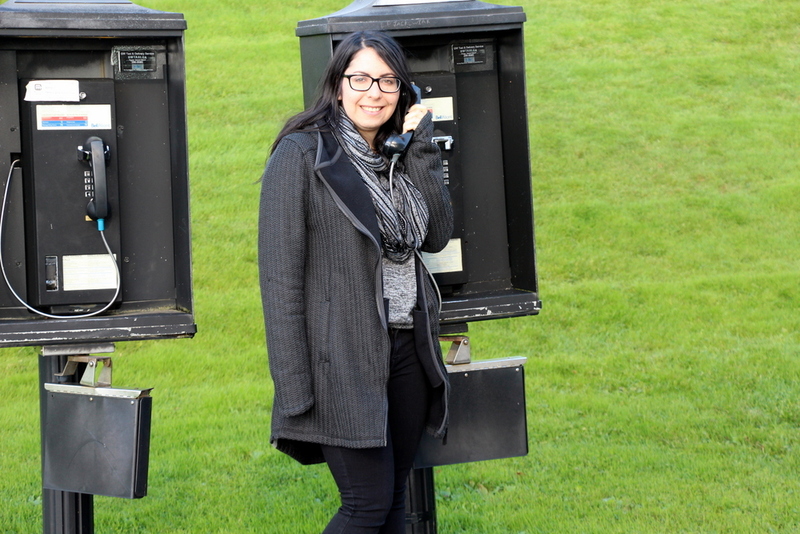 I had heard about what a nice little town Baddeck was, but the main reason I was interested in stopping was in order to visit the Alexander Graham Bell Museum. 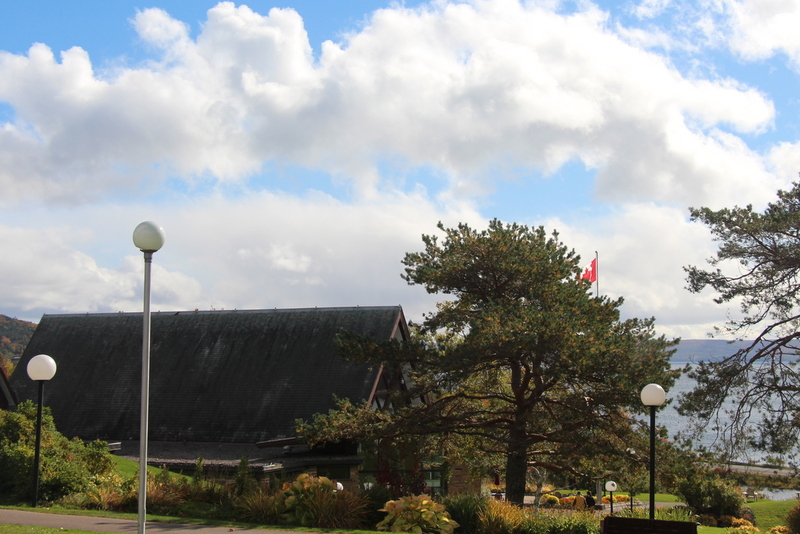 It’s on a gorgeous property and the museum itself is small but quite lovely. Although we skipped the tour and just explored on our own, I still learned a lot. 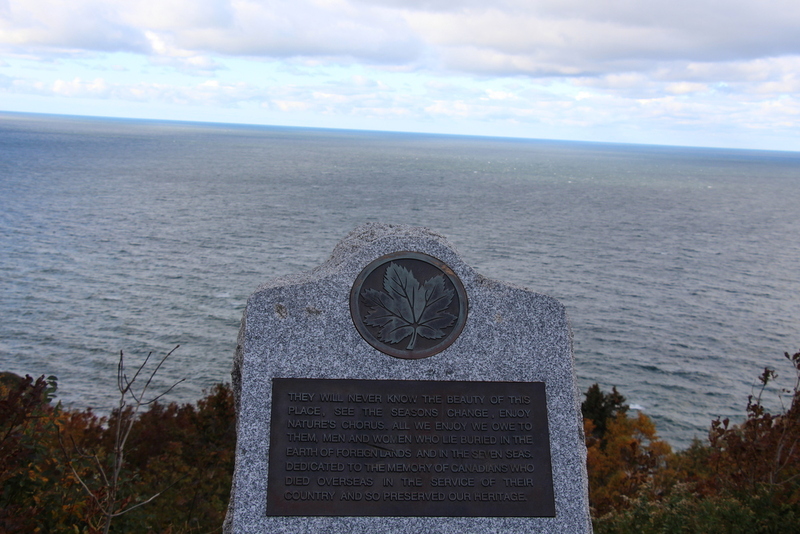 This is actually a National Historic Site of Canada, which sits on a 25 acre property and contains all kinds of artifacts from the work Bell did while living in Baddeck. 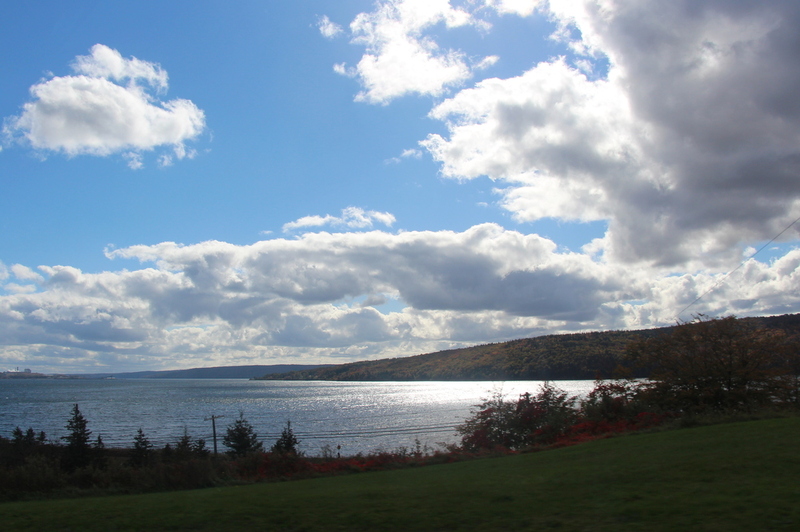 The property is gorgeous and you can easily catch a glimpse of the Baddeck Lighthouse, although we didn’t take the ferry over to go visit it. 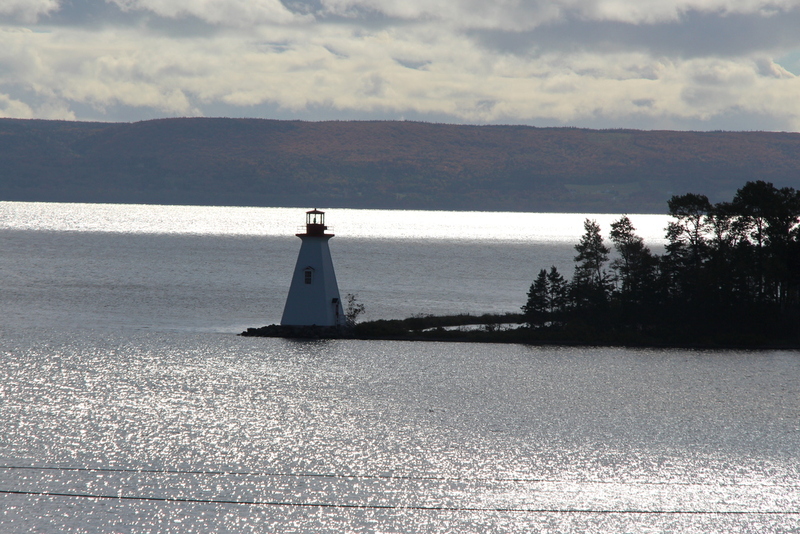 This is a beautiful place to visit and we definitely intend to see more of the Bras d’Or Lakes next year. 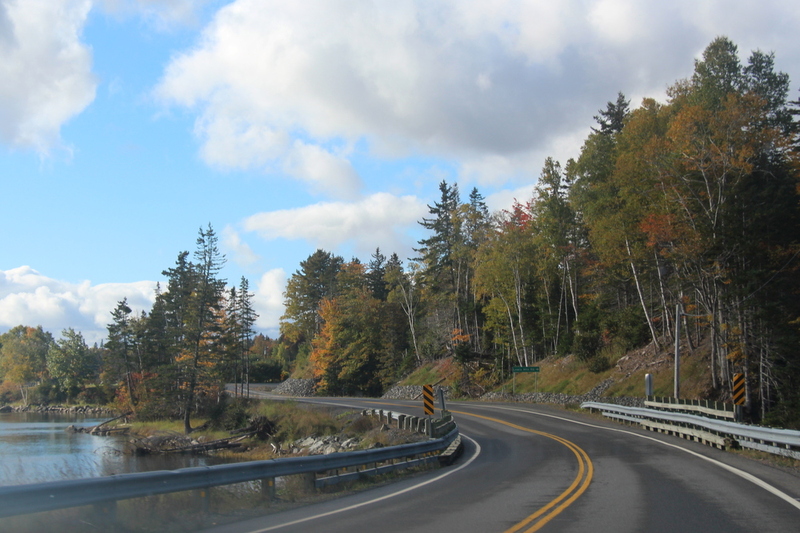 Unfortunately, the first two places we tried to eat in Baddeck had already closed for the season, which was too bad because from the reviews I’d read I was really hoping to have lunch at the High Wheeler Cafe which is excellent for gluten-free food. We ended up at the Bell-Buoy Restaurant & Supper House–where the staff even told us it was too bad the High Wheeler had closed as of that Sunday! 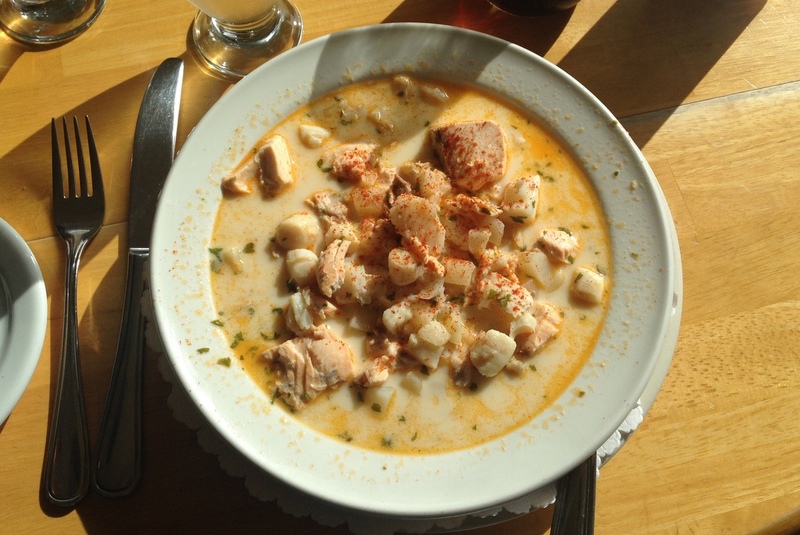 Even though the Bell-Buoy isn’t set up to be as friendly for gluten-free food, there were a couple options so I went with a giant bowl of seafood chowder. It was loaded with fish and potatoes, but I just don’t think it’s my favourite dish, and my boyfriend found the fish and chips okay but overpriced. After lunch we headed the rest of the way back home in time for late afternoon! 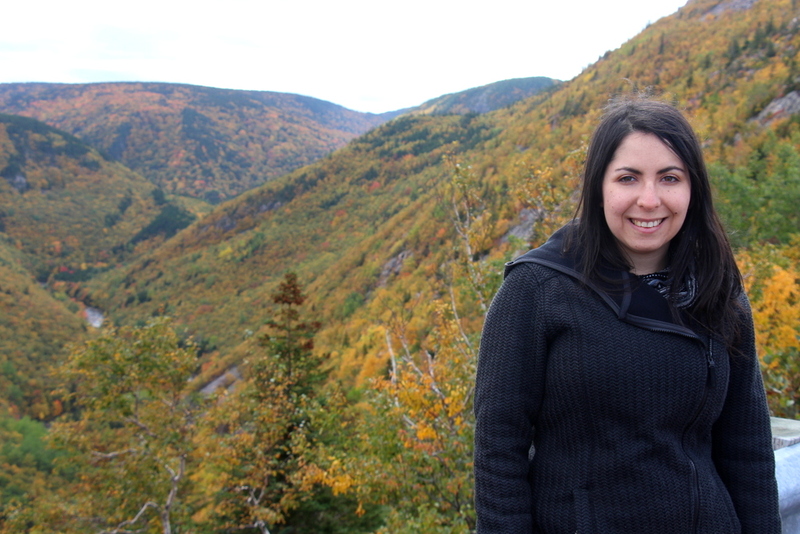 I really loved our little weekend away in gorgeous Cape Breton. After so many years of wanting to go, now I just want to go back! 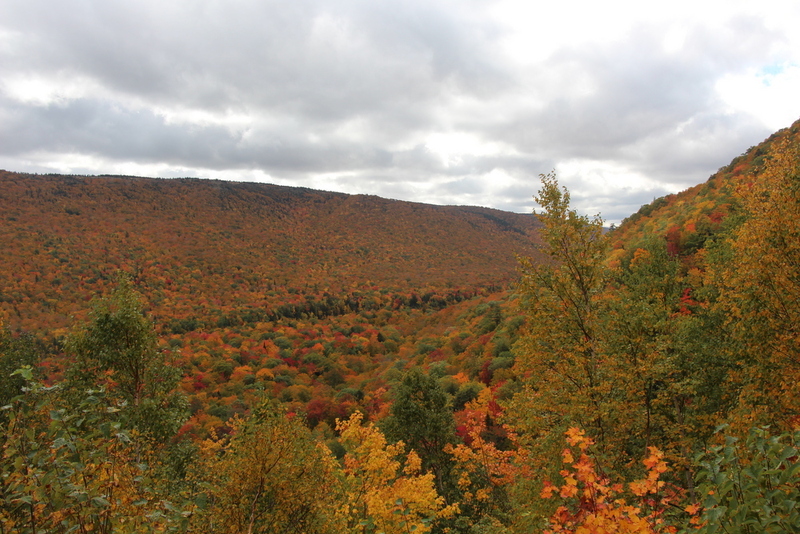 If you’re looking to experience cooler weather, more affordable accommodations and a less busy atmosphere, as well as some gorgeous changing-of-the-leaves, I highly recommend an October visit. 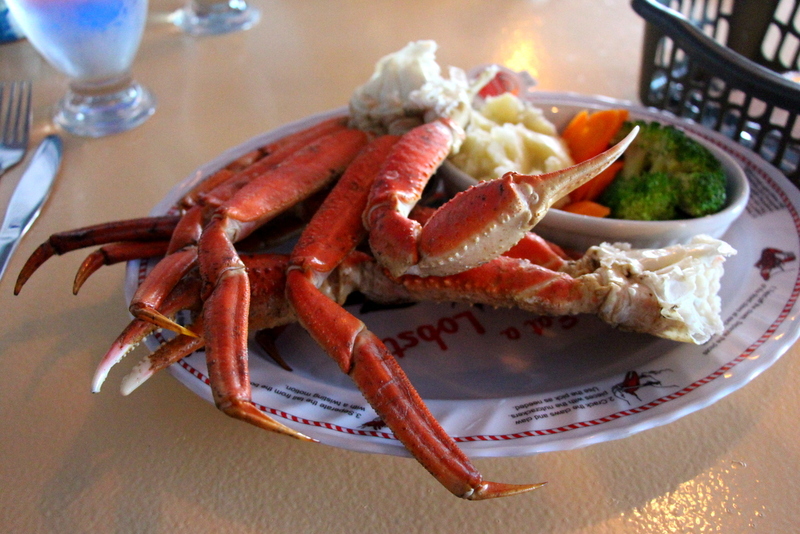 Plus, there’s some of the best, freshest seafood available! Have you booked your trip yet? P.S. Let me know what you think of this kind of content on Writing Whimsy and if you’d like to see more in the future.